This healthy and naturally sweetened raspberry coconut smoothie is dairy-free and vegan with the help of some coconut milk! I’m all about smoothies right now. I’m sure I’ve whined about this before, but it feels like there are only apples, oranges and bananas over here during the winter. And as someone who struggles to eat veggies, I need my fruit! Luckily, frozen raspberries are super cheap over here so I go through about two pounds of them every week throughout the year, except for those few precious weeks when we have fresh berries. Mr. Texanerin surprised me with two fresh coconuts right before Christmas. They turned out to be such pretty props that I’ve been making coconut everything! I was kind of shocked much I loved the raspberry coconut combination in these gluten-free raspberry coconut oat macaroons that I thought I’d give it another try. 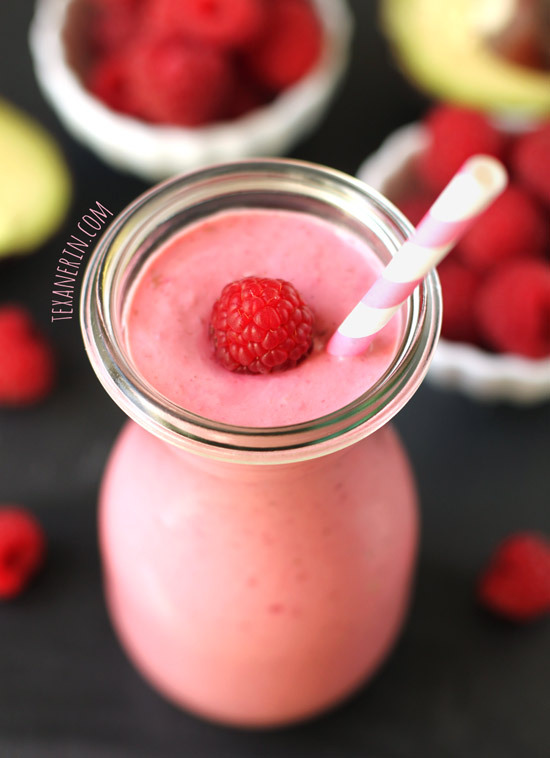 To make this raspberry coconut smoothie creamy, you can either use banana or avocado. If you use banana, the flavor will be really apparent and the smoothie will be naturally sweet. If you use avocado, you won’t taste any avocado but you’ll need to add some sweetener! I’m getting a little tired of bananas so I went with avocado this time. I added a few drops of Stevia but you could add honey, agave, granulated sugar… whatever you want! I added coconut butter to add some intense, creamy coconut flavor. I like my smoothie to be completely smooth and so shredded coconut wasn’t going to happen. If you don’t have coconut butter, don’t bother buying it just for this smoothie. Make your own homemade coconut butter! Or leave it out and add shredded coconut or a little coconut extract. 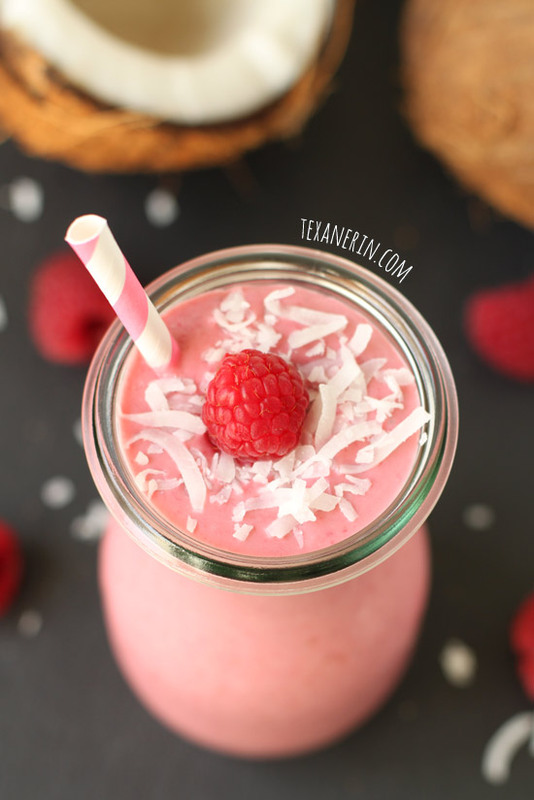 This raspberry coconut smoothie is also naturally dairy-free and vegan! No yogurt is needed. I used canned coconut milk instead of regular milk. Blend all of the ingredients in your blender, food processor or with an immersion blender. Add sweetener to taste. If you use an avocado and not a banana, you'll need to add some sweetener. If the smoothie is too thick for you, add milk until it's your desired consistency. 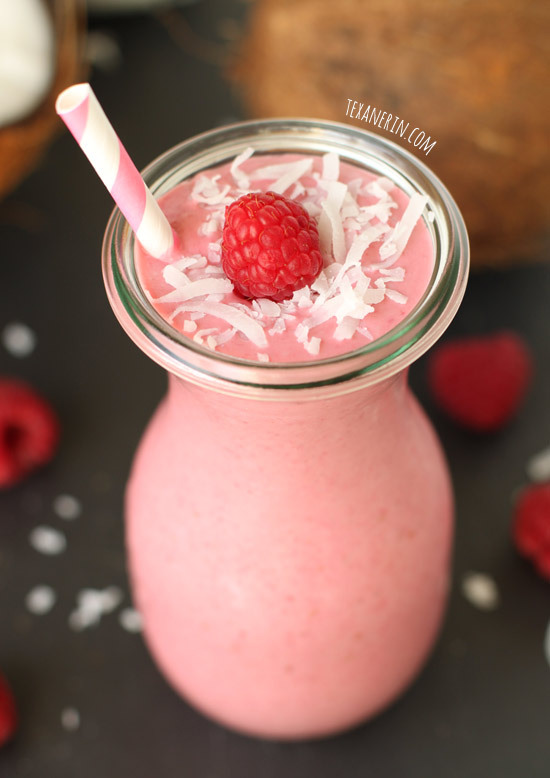 48 comments on “Raspberry Coconut Smoothie (dairy-free, vegan)” — Add one! Thanks for pinning and I agree, coconut butter is SO good! Beautiful! And it sounds like dessert :D Yummy! I can’t get enough of smoothies lately :) they play a BIG part in my weekly routine! Oh girl, love this! Made it this morning and it was heaven in a glass! This is totally my kind of smoothie!!! So pretty and pink, too! A lovely smoothie Erin. When I saw those pictures, I just had to make it. Mine was a bit more really red though, but delicious! MORE red? Well that’s nice! Red is better than green, right? ;) Thanks a ton for the feedback! We are twins today :) I guess we both had smoothies on the brain! I am in love with the pretty pink color here. Yum Yum! I am dreaming of… Awesome job! I love how many variations you give for this smoothie! And I am dying over that gorgeous pink color! So pretty! I cant wait to try this! Yes! 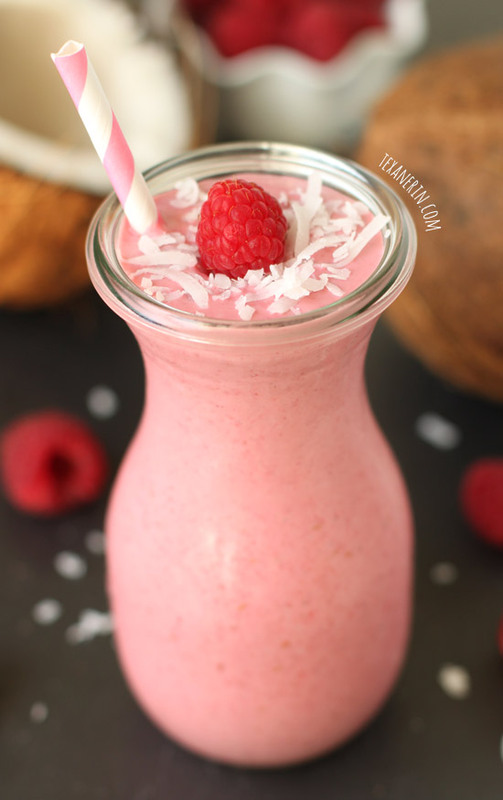 Raspberry coconut smoothies for everyone! :D I hope you’ll like it! Erin, this looks amazing! So are the photos actually the variation with avocado? It sounds like it, but I’m just in awe that the raspberry masked the avocado SO well. Will have to trial. What a great idea to combine raspberry and coconut flavors, sounds really delish! Right?! Who would have thought that raspberries and coconut would go well together! This smoothie is so pretty and I love the raspberry-coconut pairing! This looks delicious and refreshing! I never added avocado to a smoothie before–must try this next time! Would love to start my morning with this smoothie! The avocado addition in genius!! Thanks, Kelli! :) Looove avocados in smoothies! Gosh, this smoothie looks delicious. I will definitely be trying this recipe! It reminds me of a little piece of summer during these chilly, icy, snowy winter months. Also, the color is just beautiful! Thanks, Brandy! And exactly. I need stuff like this to keep me going through the winter! apparently when the weather gets ridiculously cold, I turn into a smoothie fanatic. this soudns amazing! I love your idea of using So Delicious coconut milk, that stuff is incredible. So do I! I need fruit. And apples, oranges and bananas aren’t going to cut it! Do you know that it was impossible for me to find frozen raspberries in Barcelona? This is crazy. I wanted to bake scones and I couldn’t. I need my fruits as well. Will be so nice to have blender again and mix different ones into smoothie. So pretty! I love how coconut milk makes smoothies so satisfying. Raspberry is my favourite smoothie flavour, and I always need more reminders to drink smoothies in the winter! What?! What kind of fruit are you eating then? Tons of oranges? I wish I had enough fresh fruit around to not drink smoothies constantly! These are so cute! Pinning to try soon!